Children spend the majority of their time within the walls of schools – from kindergarten through grade school, junior high school, and high school, to college. It is, therefore, of primary importance that schools are functional, engaging, and safe places, where children can grow, study, and play in a healthy and motivating environment. To achieve this, school leaders and architects working on K-12 school construction projects strive for healthy buildings that will help protect students, boost their interest in different kinds of scientific, artistic, and physical activities, and ensure their well-being. Among other things, healthier schools feature better lighting, construction with non-toxic building materials, design that encourages physical activity, and higher indoor air quality. Indoor air quality (IAQ) in schools, in particular, is extremely important for the health and wellness of children – contaminated school air can lead to headaches, difficulty concentrating, respiratory problems, and allergies. Healthy building practices make the indoor school environment safer by reducing air pollutants such as volatile organic compounds (VOCs) that may worsen symptoms of allergies and asthma in children. And one of the best ways to reduce the emission of VOCs in school air is to choose safe flooring that has a water-based, non-toxic top coat with low volatile organic compounds. The energy-efficient construction and design of modern buildings and window systems means that rooms are practically “sealed” – almost airtight. Therefore, air exchange due to circulation that would otherwise take place is lacking and if the premises has been outfitted using building materials that emit pollutants, the released toxins will accumulate in increased concentrations and pose serious health hazards to the occupants of the building. Long-term exposure to high levels of VOCs has been linked to serious respiratory diseases and even cancer. Studies also indicate that VOCs can trigger an asthma attack in someone who suffers from asthma and lead to the development of asthma in someone who doesn’t have it (asthma alone is responsible for 10.5 million school absences per year). Poor indoor air quality most often results in the so called sick building syndrome – a condition affecting people who spend a lot of time indoors (such as office workers and students), typically characterized by headaches and respiratory problems caused by unhealthy factors in the indoor environment. Since children are more vulnerable to air pollutants than adults (because, per pound of body weight, they inhale more air and, therefore – more pollutants) and absorb contaminants more readily, it is extremely important that air quality in schools should be as good as possible. School flooring – one of the most abundant finishes in the indoor educational environment – offers a great opportunity to positively impact IAQ in schools and protect the health of the students. Toxic chemicals that can lead to serious health problems. Harmful VOCs may be emitted during the floor installation process, as well as during the regular maintenance procedures (though in different amounts). Air quality can be affected not only by the flooring material itself, but also by the adhesives used to attach the floor, the surface coatings, and some maintenance compounds such as waxes and strippers. So, when choosing floor materials and associated products, schools should look for low-VOC products and flooring surfaces that are less likely to harbor mold and other allergens. not be susceptible to moisture damage that can result in mold growth. A green sports flooring made of sustainable, renewable, and/or recycled materials will help protect the environment. 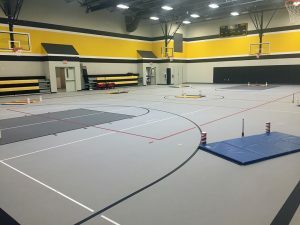 To sum it up – high-quality sports flooring is one of the most important elements in a healthier school construction project. And a healthier indoor school environment results in considerable reduction in absenteeism and remarkable increase in academic performance as well. GREENGUARD GOLD certification provides assurance that a product designed for use in indoor spaces meets the required chemical emissions limits. It is issued by the GREENGUARD Environmental Institute after rigorous testing (chemical emissions are measured during product testing to simulate actual use) and ongoing verification. 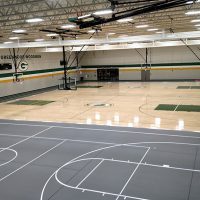 Kiefer is proud to announce that most of our commercial and sports flooring products are FloorScore® certified and/or have the Greenguard Indoor Air Quality Certification. All our synthetic floors have low VOC content and conform to the requirements of the strictest indoor air quality standards in the country. It is a green flooring material that helps preserve natural resources and reduce waste. 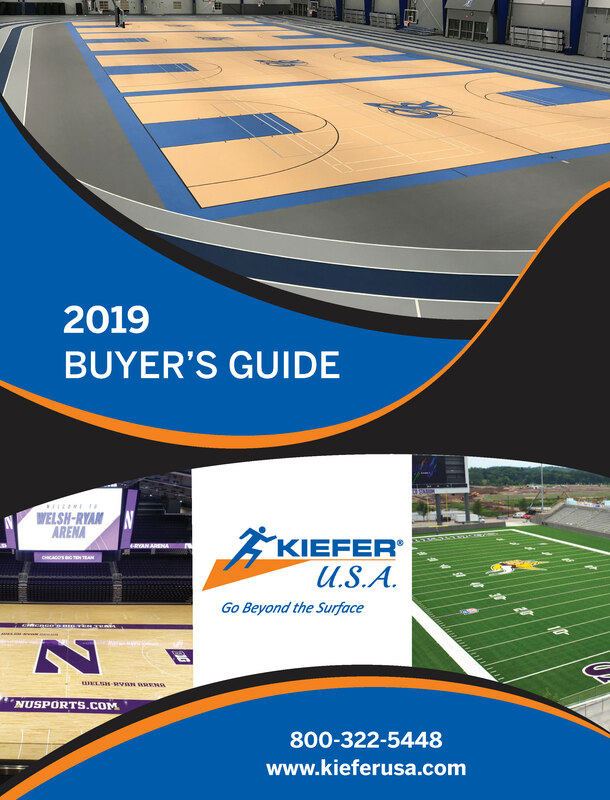 At Kiefer USA, we provide quality school flooring systems that not only deliver proper function and performance, but also protect the health and safety of students. 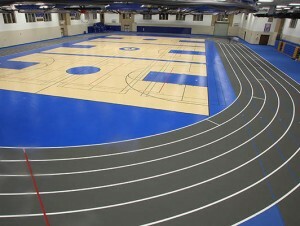 You can trust us with your new sports flooring project and rest assured that you’ll get the perfect athletic surface for your needs. Contact us at 800-322-5448 for more information! 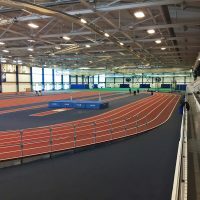 Contemporary trends in sport and fitness flooring focus on greater flexibility, increased safety and comfort, smaller carbon footprint, higher aesthetic appeal, and enhanced personality. 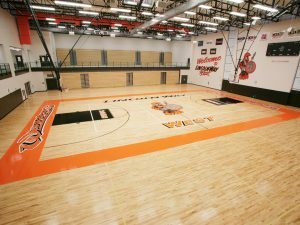 The start of the school year is the beginning of the wear and tear on the rubber sports flooring and hardwood sports flooring in your facilities. 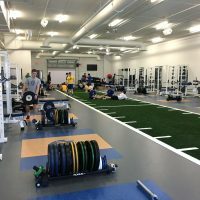 These floors experience traffic year-round, but the school year brings more students, more practices, and more time spent in the training rooms. 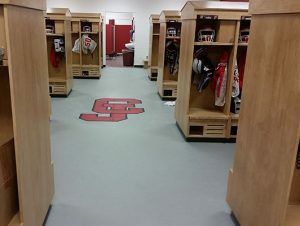 Make sure you follow these tips based on the type of sports flooring in your facility to protect your company’s investment, keep people safe, and keep the flooring looking newer longer.